SCRANTON — Like most people, Frank Wengen sees the ordinary every day. Unlike most people, he seeks out the ordinary. He stood in the middle of Marquis Art & Frame in downtown Scranton, where a collection of his paintings titled “Waterworks” was on display during First Friday, the city’s monthly art walk. His paintings feature water or boats, but focus on details that people normally overlook, such as the mooring on a dock or a tree’s branches. Many of the scenes on display were inspired by what he saw near his home in Dallas. “You can look anywhere to get an idea for a painting,” Wengen said, adding that walking through Scranton, the train tracks gave him a lot of ideas for possible projects. He was not the only artist at July’s First Friday who drew inspiration from a variety of sources. And visitors noted this artistic diversity mirrored the community’s diversity. “In today’s world, people have different views, so they all need something to express that,” said Connor Baldwin, 26, of North Scranton. He pointed to the political groups campaigning on Courthouse Square during the art walk. Bob Lettieri, 81, said he thinks one of the best things about First Friday is the different approaches that artists take on their subjects. Where Wengen may add color to draw emphasis, Shandon Black manipulates pictures to do so. One of Black’s photographs on display at Adezzo features an average utility pole. But he cut a square out of the bottom right corner and layered a gray photo underneath to border the main subject. “I get subconscious feelings that I need to take pictures. My thoughts are all over the place and my art reflects that,” he said, explaining how he doesn’t seek out his subjects as Wengen does. A.J. Riggi, 21, came to the art walk to support Black. He enjoys seeing the amount of people the event brings downtown. “Older people say it used to be booming here, but not anymore. 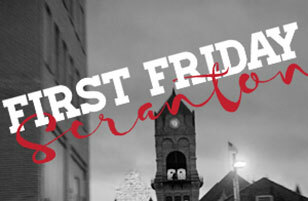 First Friday seems to change that, almost,” he said.